40% OFF! 5m 5-socket Power Extension Cord with Surge and Overload Protection worth Rs. 1,950 just for Rs. 1,150! The 5-socket Power Extension Cord is constructed of heavy-duty plastic to resist impact in workshops, garages and basements. This power strip features 5 grounded 3-pronged sockets, voltage meter, and a 5m power cord for extra reach. Plug in multiple devices to this socket that is adaptable to almost all standard plugs, and the easy-press buttons are durable. The LED indicator lets you know when a socket is switched on, and you can be aware of power usage with the voltage meter. Over current and overload duel-protection design? Device connection plug top type - Squre Pin. 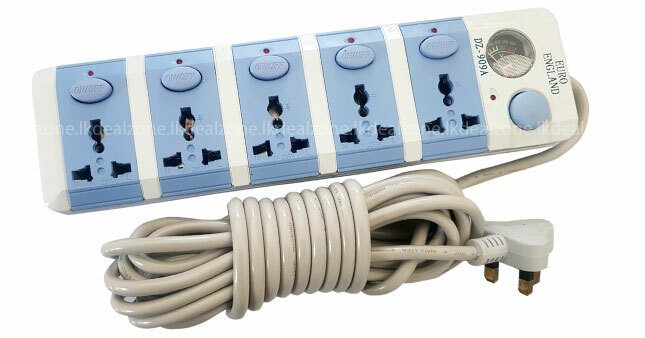 Voucher is valid only for one 5m 5-socket Power Extension Cord.